There is one problem area that every building service contractor has experienced at one time or another: excessive restroom waste. 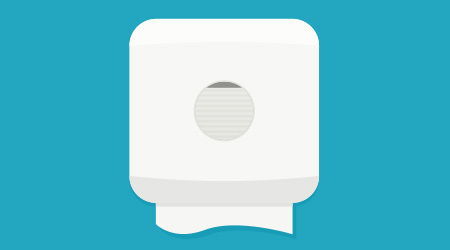 Whether it’s piles of paper products in the trash can — or worse, all over the floor — or the mess and waste of soap dispensers, the restroom provides headaches on many levels. Minimizing those problems can reduce product and labor costs. The most troublesome and wasted product in the restroom pantheon is the hand towel. Therefore, to reduce waste, is it best to use folded or roll towels? Touchless or mechanical dispensers? Many BSCs agree that folded towels seem to be worst offenders as far as accumulating waste goes. Eric Metts, owner of Premium Services Inc. in Southfield, Mich., says roll towels are much more desirable than folded towels. “Not only are the rolls more efficient, but it is also a time-management issue, because a single roll [dispenser] is easier to service,” Metts says. Roll towels are also more difficult to take from restroom locations to be used for other purposes, says Steve Altman, owner and president of All-Pro Cleaning Services in Cleveland. “The major cost issue, as far as I’m concerned, is that nobody is going to take a giant roll of hand towels back to their desk, as most people tend to take a stack [of folded towels] back to their desk for personal use,” he says. The rolls restrict user waste by making it difficult for people to use more than one at a time. Touchless dispensers that dispense only one towel at a time, have paper length control and operate on a time delay also eliminate wasteful towel use. BSCs can waste product as well, and that can be easily avoided. When it comes to soap, the considerations are vast: bulk versus cartridge, deck-mount versus wall-mount, touchless versus pump and foam versus liquid. BSCs all have different experiences and opinions regarding some of those issues. Deck-mount and wall-mount systems are implemented based more on the layout of the restroom and how the countertops are designed than by contractor preference. Most companies aren’t going to change from a deck mount to a wall mount if that entails changing the countertops, say BSCs. Automatic or touchless soap dispensers help reduce waste, says Kim T. Jones, senior project manager for Woodley Building Maintenance in Kansas City, Mo. Altman, too, favors touchless systems. He also believes foam is superior to liquid. “If you use foam, it is more efficient in the cartridge form because you use less product per pump,” says Altman. Jones says she’s also a firm believer in foam soap. Most BSCs prefer soap cartridges but those products come with the choice of changing a cartridge that has not run out or letting it run out on a potentially unhappy customer. Thompson believes in letting dispensers run their course to allow for full use, even if it means asking for a little bit of help from building occupants. Decisions about soap, towel and tissue are based on a number of factors, but BSCs have plenty of options in choosing products that best fit their needs to effectively reduce waste. D.M. Maas is a freelance writer based in Washington, D.C.